King Alfred was a terrible cook. In fact (but really in legend) while hiding from the Danes, he’d left a whole batch of cakes in the oven. They were suitably burnt and naturally ruined. So I can only guess he went to the woods and scattered them everywhere on dead ash trees to try and cover up his mistake and pass them off as some kind of fungus. Or something! King Alfred’s Cakes (Daldinia concentrica) attach themselves on the dead wood of broad leaved trees, mainly ash and beech. It’s one of those distinctive fungi I see every almost every time I’m out in woodland. Although their season is summer to autumn, the older specimens linger on the wood for years and years. Their appearance is literally that of some burnt cakes or even lumps of smooth charcoal. Older fruit bodies have a shiny surface, but younger developing fruit bodies are red/brown in colour with a duller surface. If you were to cut one open it would reveal silver/light and black concentrical zones (hence the ‘concentrica’ in the scientific name), very similar to the ring zones of a tree – or at least half a tree (due to their hemispherical shape). Other ‘common’ names for this fungus are Coal Fungus (for obvious reasons) and Cramp Balls because it used in an old folk remedy for night cramps. I think I’d rather have the night cramps! And as a great bush craft tip, these beauties are great for starting fires! The inner flesh of an old, dry specimen can be lit with a ‘firesteel’ flint for example (or even a magnifying glass). It will slowly smolder, much like your barbecue briquette and can be used to light your tinder. But needless to say – much like burnt cakes – these fungi are not edible. Having seen an excellent example of these only last week in Derby the most interesting thing remains that the tree owner had never spotted them growing throughout the crown of their live tree.! 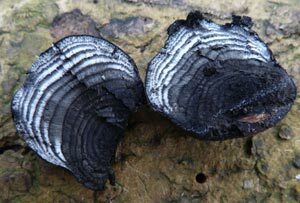 This fungi (Daldinia concentrica) mostly grows on the dead wood of ash trees. But 6 other species of Daldinia normally grow on other host trees throughout the year in the UK. Your find could be one of them. thats a facinating blog, I never knew there was another fungus which smouldered like tinder fungus. I found some tinder fungus & some other black nobs on a big dead trunk, which I think must be beech. It is covered in hundreds of black balls which I assume are King Alfreds Cakes. Any tips on distinguishing Alfreds Cakes from Witches butter? Hi Mark. Thanks for the kind comment. 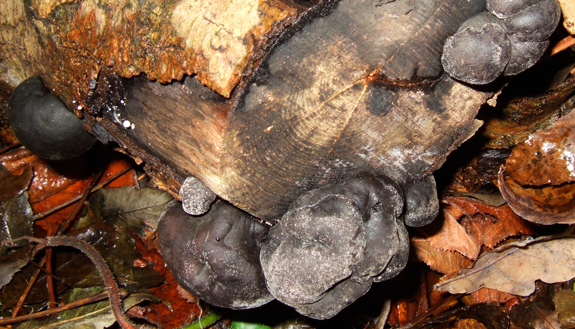 There are other similar looking dark, hard fungus to be found on dead deciduous wood. If indeed it was a beech tree it could also probably be Beech Woodwart (Hypoxylon fragiforme) which darkens with age. I don’t have a post on that yet, but you can use the latin name to search online. When younger, it is pink/reddish. In answer to your question, see my post on Witches Butter (click here). It is very distinguishable from King Alfreds Cake as it is not hard at all, but jelly like in consistency.